In 2009 I started my PhD research at the Hydrology and Quantitative Water Management Group at Wageningen University. The research focussed on morphological processes of lowland streams in the context of stream restoration. My PhD research I performed in the Netherlands. During my PhD I monitored several stream restoration projects, performed a large-scale field experiment and studied historical meandering processes. The results of my PhD research were published in peer-reviewed publications and presented at international scientific conferences. I also published several popular scientific articles and a report to support stream restoration practitioners to design, construct and maintain stream restoration projects. I monitored several stream restoration projects during my PhD research. Below you will find photos of the field sites. At three sites (Hagmolenbeek, Lunterse beek and Tungelroyse beek), I monitored the morphological development of stream restoration projects. The former channelised channel was replaced by a sinuous channel planform, typically described as re-meandering. The channel reconstruction also involved lowering of the floodplain, to accommodate more water during flood events. At these field sites, I performed morphological surveys, sampled sediment and measured waterlevel and discharge (continuously). A field-scale experiment on the development of alternate bars was performed in the Hooge Raam. Here, I studied the spatial and temporal development of alternate bars, which is related to the initiation of meandering. To achieve this, the spatial and temporal resolution of the morphological measurements was increased, compared to the other sites. At the Gelderns-Nierskanaal I studied the initiation of meandering over a period of more than 200 years through analysis of historical maps. Here, I also performed field work, however, the focus was on long time scales, therefore I analysed historical topographic maps. Measured data obtained from the four field campaigns can be found on my FigShare profile. Channelisation measures taken halfway the 20th century have had destructive consequences for the diversity of the ecology in the majority of the lowland streams in countries such as the Netherlands. Re-meandering is the common practice in restoring these lowland streams. Three reconstructed streams were monitored during the initial two years after construction of a new channel. The monitoring program included morphological surveys, sediment sampling, habitat pattern surveys, and discharge and water level measurements. Adjustments of the longitudinal bed profile formed the main morphological response. These adjustments were most likely caused by a lack of longitudinal connectivity of the streams as a whole, interrupting transport of sediment at locations of weirs and culverts. 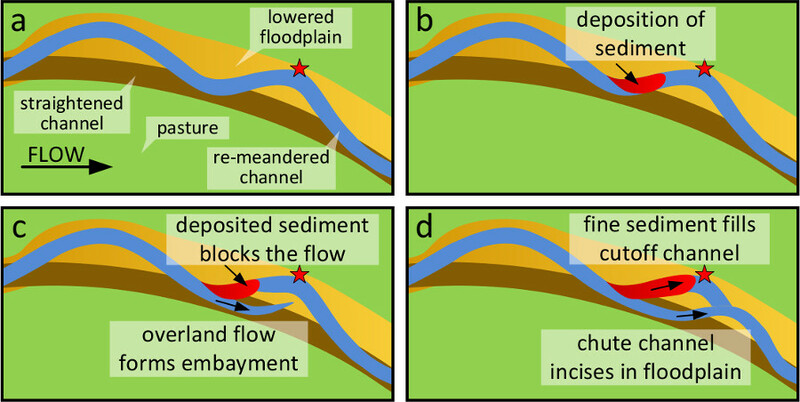 Bank erosion was observed only in a limited number of channel bends, and was often related to floodplain heterogeneity. Longitudinal channel bed adjustments and bank erosion were mainly caused by exogenous influences. In channel bends, the cross-sectional shape transformed from trapezoidal to the typical asymmetrical shape as found in meandering rivers. This behaviour can be attributed to an autogenous response to the prevailing flow conditions. Due to the prevailing fine sediment characteristics, bed material is readily set in motion and is being transported during the entire year. The existing design principles fail to address the initial morphological development after reconstruction. An evaluation of pre-set targets to realise water depth and flow velocity ranges shows the current procedures to be deficient. Based on this unfavourable evaluation, and the two-dimensional nature of habitat patterns needed to improve the conditions for stream organisms, we recommend to predict morphological developments as part of the design procedures for lowland stream restoration in the Netherlands. Stream restoration efforts often aim at creating new unconstrained meandering channels without weirs and bank revetments. In reconstructed streams, the initial morphological response of the new streams is often rapid, until a dynamic equilibrium is reached. Here we report on a chute cutoff that occurred within 3 months after realization of a stream restoration project, caused by a plug bar that formed in response to a backwater effect. The temporal evolution of the morphology of both the new and the old channels was monitored over a period of nearly 8 months, including precutoff conditions. The observations can be separated into three stages. Stage 1 is the initial period leading to cutoff vulnerability, stage 2 is the actual cutoff, and stage 3 is the morphological adjustment in response to the cutoff. In stage 1, a plug bar was deposited in one of the channel bends. Hydrodynamic model results show the location of the plug bar coincides with a region where bed shear stress decreased in downstream direction due to backwater. Longitudinal channel bed profiles show that the channel slope decreased soon after channel reconstruction. Hence, sediment from upstream was available to form the plug bar. After the plug bar was deposited, an embayment formed in the floodplain at a location where the former channel was located (stage 2). The former channel was filled with sediment prior to channel construction. It is likely that the sediment at this location was less consolidated, and therefore, prone to erosion. The chute channel continued to incise and widen into the floodplain and, after 6 months, acted as the main channel, conveying the discharge during the majority of time (stage 3). The cutoff channel gradually continued to fill with sediment, from the moment the plug bar formed until the chute channel incised into the floodplain. Sedimentary successions of the deposited material show upward fining, which is in agreement with observations of chute cutoffs in rivers. Although the artificial setting limits the degree in which the observed processes can be projected on natural rivers, the observations prompt to investigate the role of backwater effects in natural chute cutoff initiation. In de beek de Hooge Raam is een beekherstelproject gekoppeld aan een uniek veldexperiment. Het doel van het veldexperiment was om over een periode van drie jaar de temporele morfodynamiek te volgen van een rechte beekloop met een breed en ondiep dwarsprofiel. Ongeveer 8 maanden na aanleg zijn alternerende banken ontstaan. In eerste instantie namen de banklengte en bankamplitude toe. Vervolgens stabiliseerde de banklengte, maar nam de bankamplitude af. Uiteindelijk verdween het regelmatige alternerende bankenpatroon en maakte het plaats voor een grillig bodemprofiel. De dynamiek van de alternerende banken liep parallel aan het verloop van het bodemverhang; het bodemverhang halveerde van initieel 1,8 m/km naar 0,9 m/km. Het uiteindelijke bodemverhang ligt tegen de bovengrens van bodemverhangen die typisch zijn voor laaglandbeken. Het is daarom onwaarschijnlijk dat alternerende banken in laaglandbeken zullen ontstaan. Dit alternatief voor hermeandering is waarschijnlijk niet geschikt voor het herstel van laaglandbeken. Hermeandering lijkt daarom nog steeds de meest effectieve methode om de ruimtelijke stromingsvariatie in Nederlandse laaglandbeken terug te brengen. 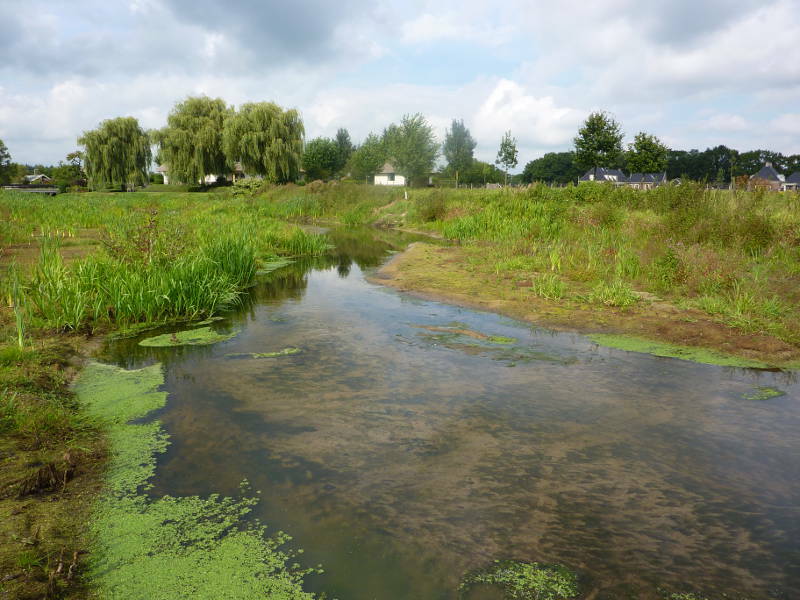 With the aim to establish and understand morphological changes in response to channel reconstruction, a detailed monitoring plan was implemented in a lowland stream called Lunterse Beek, located in the Netherlands. Over a period of almost 2 years, the monitoring programme included serial morphological surveys, continuous discharge and water level measurements, and riparian vegetation mapping, from photographs and field surveys. Morphological processes occurred mainly in the initial period, before riparian vegetation developed. The initial period was largely dominated by upstream sediment supply, which was associated with channel incision upstream from the study area. Herbaceous vegetation started to develop approximately 7 months after channel reconstruction. The monitoring period included two growing seasons. A clear increase of riparian vegetation cover from first to the second year was observed. Detailed morphological and hydrological data show a marked difference in morphological behaviour between the pre-vegetation and post-vegetation stage. A linear regression procedure was applied to relate morphological activity to time-averaged Shields stress. In the initial stage after channel reconstruction, with negligible riparian vegetation, channel morphology adjusted, showing only a weak response to the discharge hydrograph. In the subsequent period, morphological activity in the channel showed a clear relation with discharge variation. The two stages of morphological response to the restoration measures may be largely associated with the upstream sediment supply in the initial period. Riparian vegetation may have played a substantial role in stabilizing the channel banks and floodplain area, gradually restricting the morphological adjustments to the channel bed. 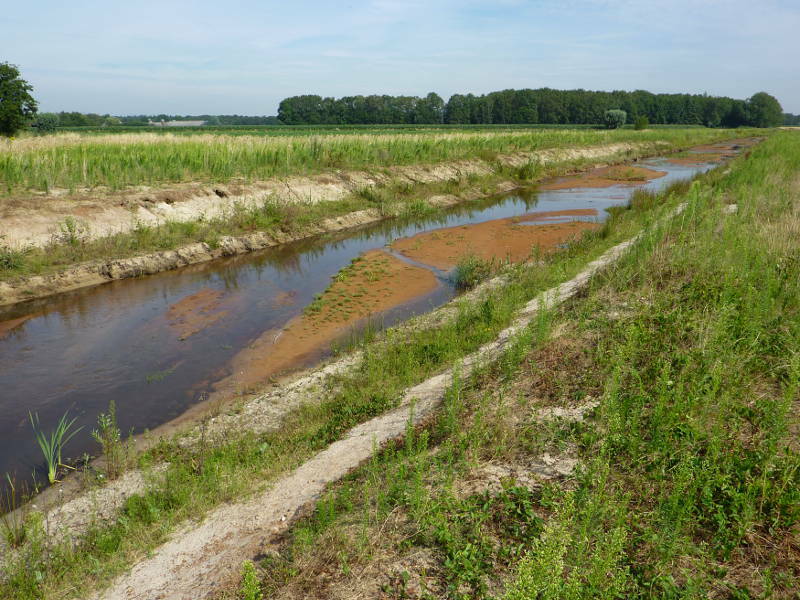 Large-scale channelisation in the first half of the 20th century caused degradation of the biodiversity in lowland streams in the Netherlands. More than 25 years ago, the Dutch water boards started restoring the degraded lowland streams, which is commonly referred to as stream restoration. Until recently, bank erosion and other changes to the streambed were not taken into account after construction of new stream channels. Data obtained from field measurements show that bank erosion mainly occurs in the first year after construction. The channel stabilizes after the first year, the so-called morphological adaptation period. Furthermore, adaptation of the channel slope has been observed. Local channel narrowing (such as bridges), and variation of the subsoil (such as gravel bars) influence morphological changes of the streambed. In future stream restoration projects it is worthwhile to take these local influences into account, to reduce the risk of unfavourable changes to the streambed. In de eerste helft van de 20ste eeuw zijn veel laaglandbeken in Nederland gekanaliseerd. Dit heeft vaak geleid tot grote veranderingen in de hydrologie en morfologie van beken, met als gevolg een sterke achteruitgang van de bijbehorende karakteristieke aquatische en terrestrische ecosystemen. In de afgelopen 25 jaar zijn de Nederlandse waterschappen begonnen met beekherstel om wateroverlast te voorkomen, verdroging terug te dringen (Waterbeheer 21e eeuw) en de ecologische (water)kwaliteit van beeksystemen te verbeteren (KRW). Eén van de meest toegepaste maatregelen hierbij is hermeandering. Uit het onderzoek van Joris Eekhout komt naar voren dat laaglandbeken in Nederland over het algemeen weinig morfodynamiek kennen. Er komen alleen incidenteel substantiële morfologische veranderingen voor, maar deze zijn lokaal van karakter en vinden veelal plaats in het eerste jaar na aanleg. De veranderingen zijn vooral toe te schrijven aan externe factoren, bijvoorbeeld erosiegevoeligheid van de oevers en aanpassing van het lengteprofiel door stuweffecten. In die periode zal dan ook intensievere monitoring moeten plaatsvinden. In de daaropvolgende periode lijkt de beek zich te stabiliseren en voltrekken morfologische veranderingen zich langzaam. Uit dit onderzoek komt ook naar voren dat de laaglandbeken een hoge dynamiek in de afvoer kennen, wat mogelijk een nadelige invloed op het herstel van het ecosysteem heeft. Herstel van de hydrologie vraagt om nader onderzoek. Samenvattend blijkt uit het onderzoek dat laaglandbeken weinig morfologische dynamiek kennen en het aangelegde beekprofiel vrij stabiel is. Het beekontwerp wordt daarmee van groot belang. Het onderzoek geeft hiervoor vanuit de morfologie belangrijke aandachtspunten. Over een periode van anderhalf jaar zijn morfologische, hydrologische en ecologische ontwikkelingen gemonitord na een herstelproject in de Lunterse Beek. Tijdens een initiële vegetatieloze periode was de morfodynamiek groot, met een bochtafsnijding, oevererosie en oeveraangroei. Deze processen zijn gerelateerd aan de aanpassing van het lengteprofiel, dat sedimenttoevoer tot gevolg had. Vervolgens heeft vegetatie zich in de inundatiezone ontwikkeld. De morfodynamiek nam in deze periode af, de morfologische veranderingen speelden zich met name nog op de beekbodem af. De metingen laten zien dat de beekbodem stabiliseert na een initiële morfologische aanpassingsperiode van ongeveer acht maanden. Alternate bars in rivers and streams develop as a result of differences in length scales involved in the adjustment of flow and sediment transport to irregularities of the bed. The amount of field evidence supporting theoretical insights is highly limited. Here, we present results from a large-scale field experiment in a 600 m long straight reach. Over a period of almost 3 years, the channel was allowed to evolve autogenously from initially flat bed conditions, subject to discharge variation. Alternate bars developed within 8 months from the start of the experiment. The initial stages of bar development included bar growth, both in wavelength and amplitude, and bar migration. The latter was too limited to classify the bars as being migrating bars; therefore, we classify the bars as nonmigrating bars. Toward the end of the experiment, the regular alternate bar pattern evolved into an irregular pattern and bar amplitude started to decrease. From the start of the experiment we observed a declining channel slope, from 1.8 m/km initially to 0.9 m/km halfway the experiment, after which it stabilized. We applied two bar theories to establish their predictive capacity. Both bar theories predicted the development of alternate bars under the constructed channel conditions. In response to the declining channel slope, both theories predicted a decreasing likelihood for the development of alternate bars. Our study shows that under field conditions, the applied bar theories may predict the initial stages of bed development. Door het meanderen zijn meanderbochten afgesneden en het benedenstroomse deel van het kanaal heeft zich diep ingesneden. De meander- en insnijdingsprocessen zijn geanalyseerd op basis van historisch kaartmateriaal (1806-2006), LiDAR-data (1997) en veldobservaties. Het blijkt dat meandering op drie verschillende plekken langs het kanaal is begonnen. Juist op die plekken zijn ook aanwijzingen voor kwel gevonden, in de vorm van sterk roestige lagen in de bodem langs het kanaal. Hieruit valt op te maken dat lokale kwel de oevers heeft verzwakt en zo de eerste aanzet tot meanderen heeft gegeven. In analytical and numerical models of river meandering, initiation of meandering typically occurs uniformly along the streamwise coordinate in the channel. Based on a historical analysis of the Nierskanaal, here we show how and under which circumstances meandering has initiated in isolated sections of a channel. The Nierskanaal was constructed by the end of the 18th century, as a straight channel between the river Niers and the river Meuse. The purpose of this measure was to reduce flood risk in the downstream reaches of the river Niers. The banks on the Dutch part of the channel were left unprotected and developed into a morphodynamically active channel, featuring a meandering planform and valley incision. The planform development and incision process is analysed using topographic maps and airborne LiDAR data. Meandering initiated in three sections of the channel, where the channel sinuosity developed asynchronously. Sedimentary successions in the study area show layers of iron oxide, indicating groundwater seepage from aeolian river dunes and river deposits located nearby. Only at the spots where meandering has initiated iron oxide is found close to the surface level. This provides a clue that seepage triggered bank erosion by increasing moisture content of the banks. The isolated meandering sections expanded in the longitudinal direction. Valley incision has developed in the first decades after the construction of the channel, and diminished after a gravel layer was reached. Gravel was deposited in the downstream half of the channel bed, acting as an armouring layer. The spatial variation in meandering behaviour, as observed in the Nierskanaal, justifies efforts to implement the influence of floodplain heterogeneity and the effect of seepage on bank erosion in meander models. 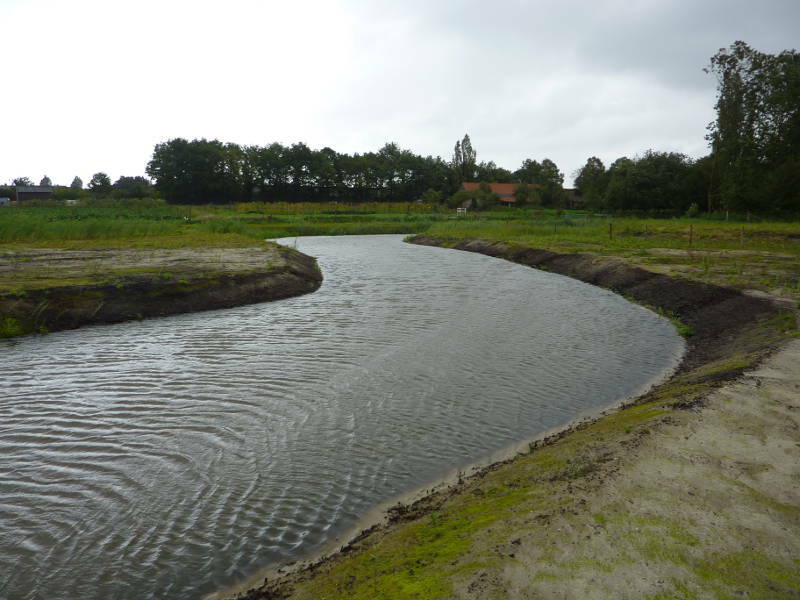 Within the Dutch research project ’Valley wide meander restoration’ six restored streams will be monitored over a 2-year period. The monitoring program aims at understanding initial morphological processes and the associated ecological developments. The present study focuses on the morphodynamic developments that took place after the completion of one of the restoration projects. The morphology and hydraulics of the field sites are evaluated using sequential GPS-surveys, discharge records and information from sediment samples. The present contribution concerns the Hooge Raam, where a new channel is constructed parallel to the stream that was to be restored. The channel was designed to investigate the autogenous formation of a meandering channel from an initially straight reach, designed based on hydraulic geometry relations. Eight months after construction of the stream, alternating bars emerged in the downstream part of the stream. Analysis of ten successive bed level surveys about two months apart shows channel bar migration and an increase of both the bar height and their wavelengths. Bar wavelength is increasing in time until it reaches an equilibrium value. The dynamics of both migration speed and bar height respond to the dynamics in the varying discharge.